You raised an incredible woman. You’re proud of the person she has become and want her to have all the best things in life. Send her the tasteful, sophisticated Floral Doodles Happy Valentine’s Day card to let her know about all the love you’re sending her way! The graphic looks hand-lettered and drawn, the fonts are whimsical and sweet, and the color palette is pleasing to behold! I hope your day is beautiful and full of love, daughter of mine. May it be filled with messages of love, heart-shaped cookies, and fragrant flowers. I love you! 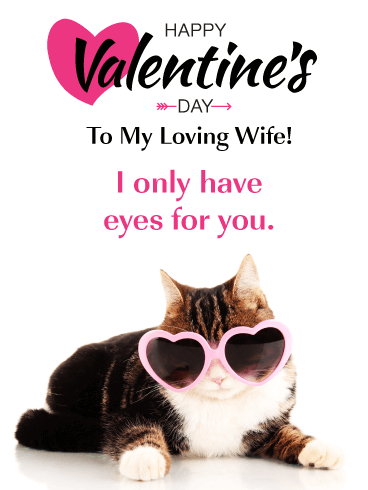 If your wife is a cat lover then she is going to just adore this Valentine’s Day card. It showcases a cute cat wearing pink heart-shaped sunglasses, so she will think it’s funny when she reads that you only have eyes for her. 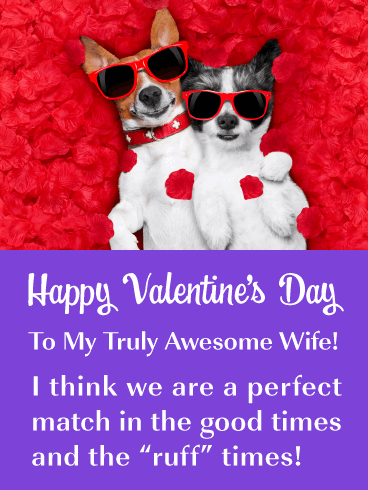 This Valentine’s Day card has a wonderful design that will bring a smile to your wife’s face. Send this Valentine’s Day cat over to your wife today! If you think your wife would prefer a cute and funny Valentine’s Day card, you are in luck! 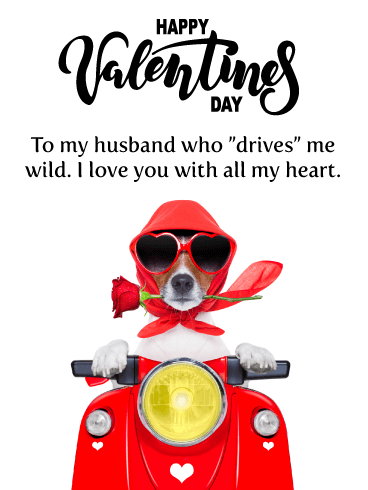 Adorable puppies resting in a bed of roses and wearing sunglasses set the stage for this eye-catching Valentine’s Day card! It will certainly give your wife a little laugh and make her smile, especially when she reads that you are a perfect match through the good times and the ruff! Send these puppies to your wife today, they can’t wait to meet her! Melt your wife’s heart with this loving and romantic Valentine’s Day card! It features a man that is about to give his wife a special red rose. It’s what every woman would hope for on this special day. The message expresses that you are thankful that she is your wife, and that she is not just your true love, but also your best friend. Your wife is going to love you even more once she receives this great Valentine’s Day card! 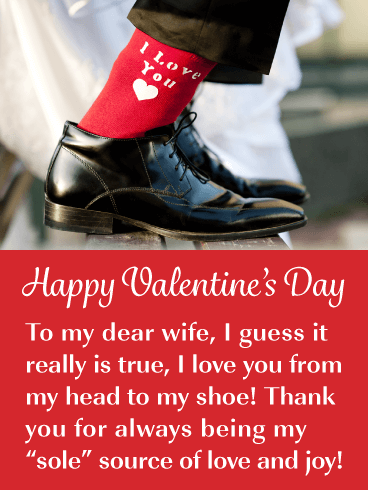 Give your wife a reason to laugh on Valentine’s Day by sending her this funny greeting card that features a special pair of socks! They have the words “I Love You” written on them and it’s not something you see every day! She will love the play on words that she is your ”sole” source of love and joy. Take the next ”step” and send this awesome Valentine’s Day card to your wife soon! Your daughter works hard and she deserves a little self-care time this month! Wish that beautiful woman a Happy Valentine’s Day full of expensive (or cheap!) 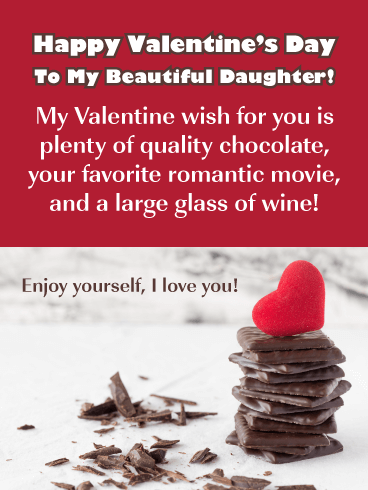 chocolate, her favorite bottle of wine and the best rom-coms with the Wishing You Chocolate Valentine’s Day Card! With a mouthwatering stack of chocolate squares and shavings, this card will have your daughter drooling in delight! Well hot dog! 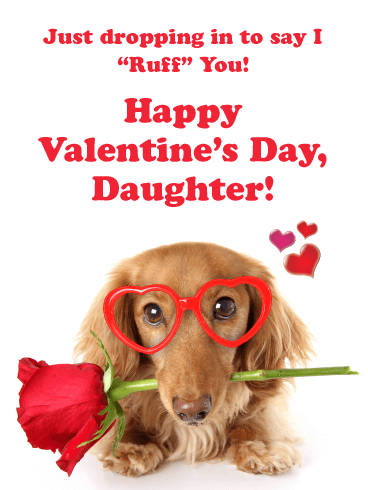 It is Valentine’s Day once again and you need something special for your fur-avorite, fun-loving daughter! Send her the I Ruff you Valentine’s Day card with this adorable dachshund in heart-framed eyeglasses to put a huge grin on her chin! This cuddly cutie offering a single, red rose is sure to have your wonderful daughter tickled pink! Remind your wife of how romantic you really are with a Valentine Day’s card that showcases wedding rings, hearts, and champagne! 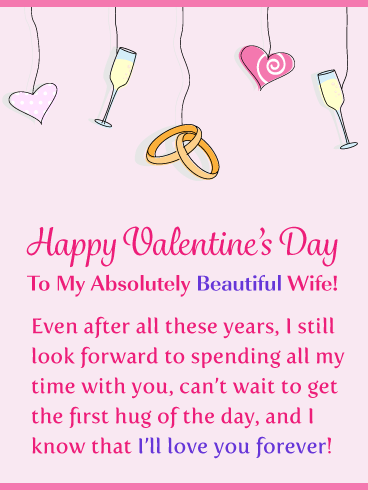 This fabulous greeting card has the most heartwarming message that lets your wife know that after all these years, you still look forward to spending all your time with her and that you will love her forever. So romantic! Get this touching Valentine’s Day card out to your wife today so she can enjoy it on this special day. 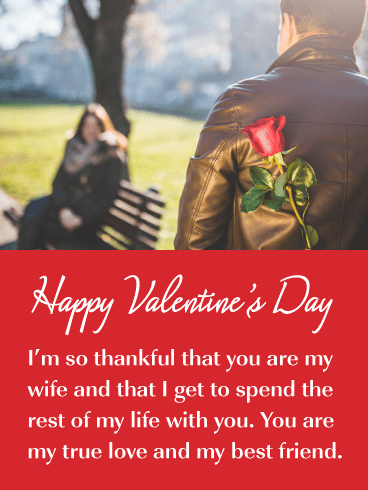 Send a special message of love to your wife with this fabulous Valentine’s Day card. It will certainly make her love you even more! This greeting card features creative lettering that spells the word LOVE. It looks very stylish! 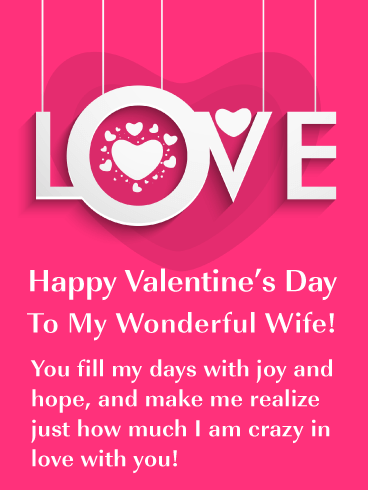 This Valentine’s Day card will allow you to tell your wife that she fills your days with joy and hope. It will also let her know how much you love her. It’s the perfect message for this Valentine’s Day! 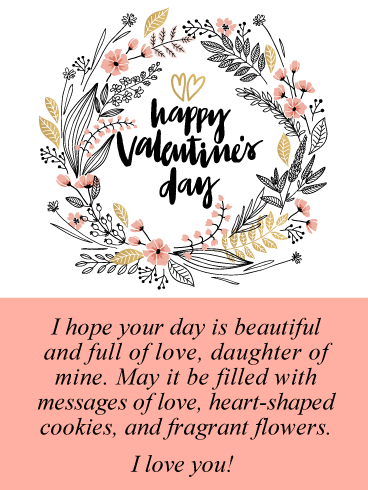 Make your daughter smile and bust out into a fit of giggles just like when she was a little girl by sending her this silly Valentine message! 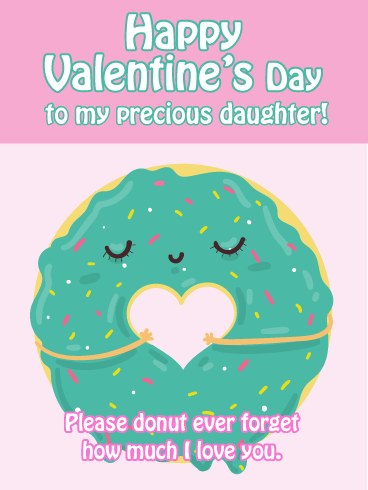 The Donut Forget Happy Valentine’s Day card is both sweet and funny! Remind her to not forget how much you love her with a frosted, sprinkle doughnut almost as precious as she is! 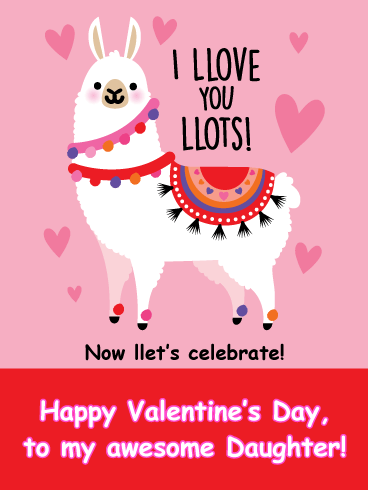 Your sweetheart daughter will absolutely “llove” this darling Llama card! 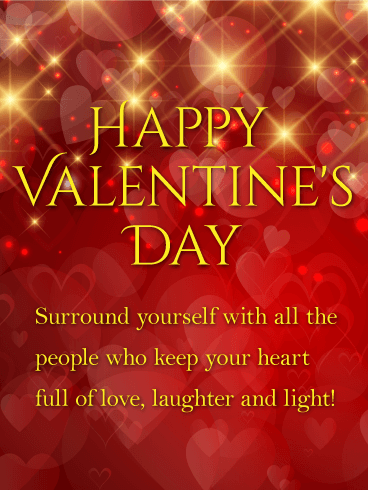 Send your special girl the Llove You Llots Happy Valentine’s Day card to put a smile on her beautiful face this year. Powerful pinks, radiant reds and happy hearts make this Valentine extra festive, while the joke of using double Ls as in Llama will have her rolling with laughter!